La vara, merece mucho la pena hacerla y yo diría que es un "must" en esta expansión para todo enchanter. Se notan los materiales extra que te dan al tenerla. Con tenerla en las bolsas funciona, no hay que hacer nada. Aparte tiene activa que consumiendo un Cristal velado puedes controlar algunas entidades que te encuentres por ahí para que luche a tu lado. Pero es más para hacer el tonto, porque el coste es muy alto para el poco daño que hacen y lo poco que duran... Para más info, en los últimos párrafos doy más detalles. Para poder empezar el hilo de misiones con el que consigues la receta para hacer esta vara: Receta: vara encantadora de Iwen , tienes que ser lv 120 y tener el Enchant de esta expansión subido a 150. Cumplido eso, el instructor de encantamiento de tu ciudad te permitirá coger la quest inicial (si abres el mapa, se resalta una exclamación amarilla donde se inicia la quest, si eres horda Encantadora Quinni, si eres alianza Emily Buentiempo) que concluye con la receta de esta varita aprendida. El hilo de misiones es fácil, se hace en Drustvar y no toma demasiado tiempo (diría que unos 15-20 minutos aprox). Para craftear la vara, aparte los ítems de crafteo que te pide (20 Fragmento umbrío, 10 Cristal velado y 10 Expulsom, tienes que farmear de otras criaturas otros ítems especiales. - Piedra rúnica de Thros: Te la da el último boss de crestavía (Gorak Tul), supongo que el típico ítem que sale con 100% de drop. Y ya "sólo" te quedará farmear 50 Esencia de Drust persistente. Los bichos de Masión Crestavía, lo dropean, yo acabé con 10 tras completarla en HC, (aunque la gente, me ha dicho que ha salido con menos... y aparte la dificultad con que lo hagas, es irrelevante). Pero antes que seguir haciendo más Crestavía, lo más eficiente y lo que viene en todas las guías y foros, es que los saques en el Bosque Carmesí, (en Drustvar, viene escrito en el mapa, está justo al sur del punto de vuelo "Calacualquiera"), donde aparte de que toda la mob de allí puede dar esencias, hay 3 brujas élites (coordenadas: /way Drustvar 20 54 ) que te dan siempre una o dos esencias cada una (entre 3 y 6 cada vez que matas a las tres) y respawnean justo pasado 1 minuto. Entonces para sacar las esencias lo antes posible, la historia es que vayas, mates a las brujas; en menos de un minuto junta y mata a una mob de por allí sin alejarte mucho y vuelvas a matar a las brujas justo antes de que respawnén para que sea más eficiente. Aunque el drop de las esencias de los bichos de por allí, es bastante bajo (de una mob de más o menos 10 bichos, lo normal es que saques 1, o puede que ninguna, con mucha suerte 2...), por lo que si quieres esperar el minuto a que salgan sin hacer nada, también es buena opción. Así en un ratín, te sacas las 50. Con la habilidad activa de la vara, puedes levantar para que te siga una Máscara vudú inerte y otras entidades, usando la vara mientras seleccionas el NPC. Para esto, te consume y debes tener en tus bolsas un Cristal velado, y te ayudará durante 30 minutos atacando al objetivo que ataques tú. Si entras en alguna mazmorra, el bufo y la máscara desaparece... Están esparcidas por toda Zuldazar, pero no hay demasiadas... Haced click aquí: |Máscara vudú inerte| para ir a la página de ese NPC y ver los mapas con sus posibles localizaciones (yo la encontre en: /way Nazmir 64.8 37.4 ). El bufo que te pone es este: Encantar máscara vudú y mientras lo tengas, cuando camines por los exteriores de cualquier zona, saldrá la máscara y te ayudará. Su daño, es bajo, entre un 3% y un 5% de mi DPS, hace un ataque básico continuo a un objetivo (alrededor de 2.5k por golpe) y de vez en cuando hace esta skill de daño de sombra a un objetivo: Mirada vudú (alrededor de 3.5k por golpe); por lo que en resumen, para mí, o la mejoran y/o le bajan los requisitos para usarla, o no merece la pena gastarse un cristal velado en levantar una máscara, mucho coste para poca recompensa. 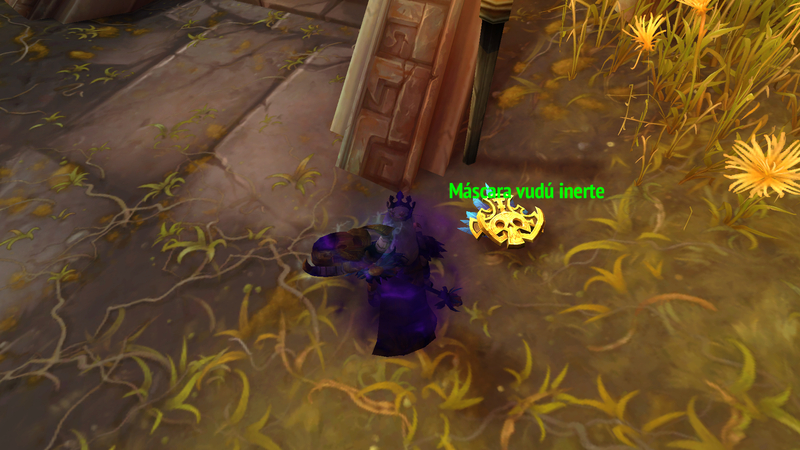 En Kul Tiras puedes devolver a la vida un Vigilamareas inerte Supongo que en Zandalar lo que hay para animar son máscaras y en Kul Tiras esos Vigilamareas que son como pseudo-Big Daddys del Bioshock: https://i.imgur.com/wHlHxaf.jpg . Al usar la vara, te dan este bufo: Encantar vigilamareas . Pega golpes básicos de +1.5k, más rápido que la máscara y de vez en cuando Pisotón de trueno , un ataque AoE que pega +2.5-3k. A la larga, pega algo más que la máscara, un 5-6% de tu DPS, por lo que muy flojito también. No sé si habrá más criaturas para animar con la vara. At long last, a (still technically unnecessary so far but still available) upgrade for those of us who still have our Runed Elementium Rod. I'm only disappointed I didn't get to make the other twelve or so materials of enchanting wand we could have had in between them deciding "nah, a magic wand that a level 5 warrior could create is more than enough to handle any enchantment the defender of a shattered world, savior of pandaria, commander of their faction, the champion of argus, etc. could learn to do" and now. > Reencantando: Encantar vigilamareas for Kul'tiras, Encantar máscara vudú for Zandalar. what a complete waste of time, other than the Vara encantadora de Iwen "Gain extra resources when disenchanting." EDIT: some are saying that Vara encantadora de Iwen basically just allows you a CHANCE (so NOT 100%) at getting a Cristal velado from disenchanting BfA items that normally wouldn't give one. TL/DR; BfA green items have a small chance to give a Cristal velado instead of the normal Polvo lúgubre and/or Fragmento umbrío. I think they should make the rod give you expulsom when disenchanting at the same rate the scrapper does. Maybe that's part of what they mean by saying it makes you "Gain extra resources when disenchanting." Enchanters that are level 120 with 150 Skill Points in Battle for Azeroth Enchanting can unlock a special Tools of the Trade questline, rewarding Vara encantadora de Iwen. Pick up the Enchanting quest starting from Encantadora Quinni in Zuldazar or Emily Buentiempo in Boralus. A full walkthrough of the Enchanting quest, which explains the lore of the Thornspeakers and the Drust, can be found here. It does indeed function as an Enchanting Rod, allowing you to finally get rid of that pesky Vara rúnica de cobre. The chance to gain extra disenchanting materials seems to not be 100%, and seems to only affect Battle for Azeroth items. Disenchanting with this item in your bags does not grant Expulsom. LWs get bloodlust and we get... a stupid golem... that costs mats we need for actually *useful* things. Sigh. Brazo de mimbre enredador did drop in Waycrest Manor normal. The lingering drust essence also drops from the hexwood seers and binders I got them all there but the drop rate isn't 1-1. Don't trash your Runed Elementium Rod.. its unobtainable so it's a pretty neat item to have an as enchanter tbh. I spent a veiled crystal so you don't have to. I found an inert voodoo mask NPC sitting on the ground in Zuldazar. Interacting with it told me that a properly equipped enchanter could revive it. Clicking the Iwen's Enchanting Rod used up a veiled crystal from my bags (it cannot use veiled crystals from the bank) and brought it to life. I've also seen disabled "harvest golem" looking things on Kul Tiras which give similar text when interacted with. You gain a 30 minute buff and so long as the buff is active the mask will follow you around attacking enemies you engage. It stealthed when I stealthed. It reappeared after using the flightmaster's whistle, taking a flight path, and sailing to Kul Tiras. However the buff was removed and the mask vanished when I entered a dungeon instance. 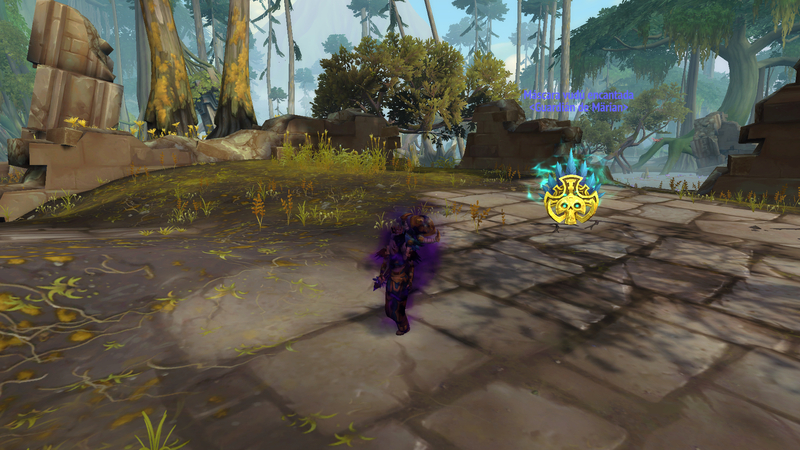 While doing some world questing it contributed about 3% of my damage, split between its melee attacks and a melee-range shadow damage spell it casts. It never pulled aggro from me (it also only had about 44k health so wouldn't have been much of a tank), and did no healing. As expected it's very underwhelming. It could be a cute addition to sometimes have a mask or golem join you, but I'd rather have the veiled crystal. Anyone know if this gives extra titan residuum or not? So to get the extra materials do I just need to have this rod in my bags? Or do I need to consume it? I have found that there's NPCs out and about Drustvar that drop the Lingering Drust Essance. Anything that is considered "Ancient Drust Enemies" such as the stone and Awoken golems in the snow and the Wicker Beasts and Golems around any bewitched areas. Though going into a Waycrest Manor seems the most efficient way, you can only do a Mythic run once a week. So the best way is to go out there and find all of the wicker mobs and the Drust ancients you can and kill them all in packs. i went Waycrest Manor normal in tool and got 6 Esencia de Drust persistente while in a 5man party. then i went there by my self and cleared the same mobs and bosses and got 26 of one run. another single run for the last ones. It DOESN'T work if you put it on your bank. Asked a GM before but he couldn't answer me because he didn't know. Well...so I tried with a lot of items. No proccs while at bank, many procs while in my own bags. Make 1. Keep in bags for lots of extra enchanting mats. Not worth using on Golems. This thing is probably the best of the new tools because you get an amazing amount of extra enchanting matts when you enchant. While the golem/mask does have pretty low dps (about 1500-2000) it is mildly useful for rogues because it'll pick up aggro on a mob you're fighting. This lets you use a vanish to reset your openers, something you can't normally do when fighting mobs solo. Who wants to try restoring every item they've disenchanted or sold in the past 6 months then disenchanting them all again to see if you get a much higher amount of materials this time around? Obtienes recursos extra al desencantar. "El poder de la magia Drust hace que la vara vibre. También puede servir de vara encantadora rúnica inferior."